Not only is Russell Brand in West Hollywood with an attractive woman, but it turns out he’s actually MARRIED! Remember the big hoopla when he married Katy Perry a few years ago? – that union only lasted 18 months. We don’t find him particularly appealing so we ARE a bit surprised to learn that he married Laura Gallacher (she’s in the restaurant business) last August and they have a one year old daughter Mabel. Brand claims he’s not the same corrupt slug he used to be – but time will tell. 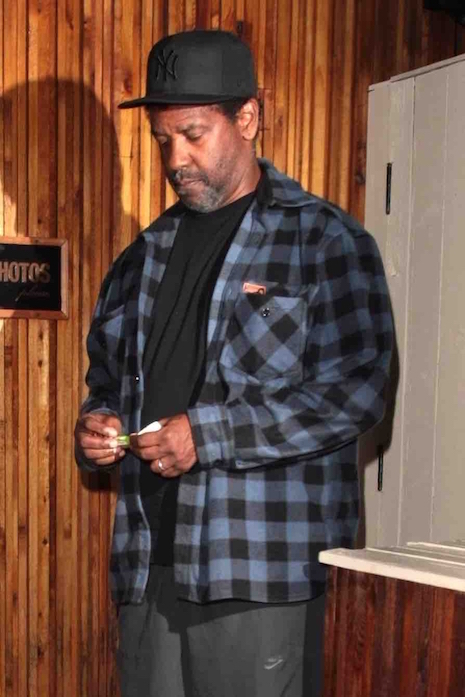 Denzel Washington looks like he’d rather NOT be where he is, but he turned up at The Nice Guy because his son John David Washington was celebrating his birthday there. (John stars on the series Ballers with Dwayne Johnson.) We remember a few years ago when Denzel was quite a party guy and we saw him in all the hot clubs – especially in New York. He was a big flirt but his wife Pauletta never gave up on him. Now they’ve been married for 34 years and have four kids – so she must be doing SOMETHING right! So much happened this last weekend that few people seemed to notice that Madonna’s brother Christopher Ciccone, 55, got married – and that includes his sister. Of course Madonna and Christopher have had a tumultuous relationship. At one time the artistic Christopher directed Madonna’s music videos, helped design her stage shows, and decorated her homes. They were very close until she “fired” him and accused him of slacking off and substance abuse. (At that time he was also described as being “obnoxious.”) In 2008 Christopher wrote a tell-all book titled “Life With My Sister Madonna” describing Madonna’s MANY idiosyncrasies and to no one’s surprise, she didn’t speak to him for four years. 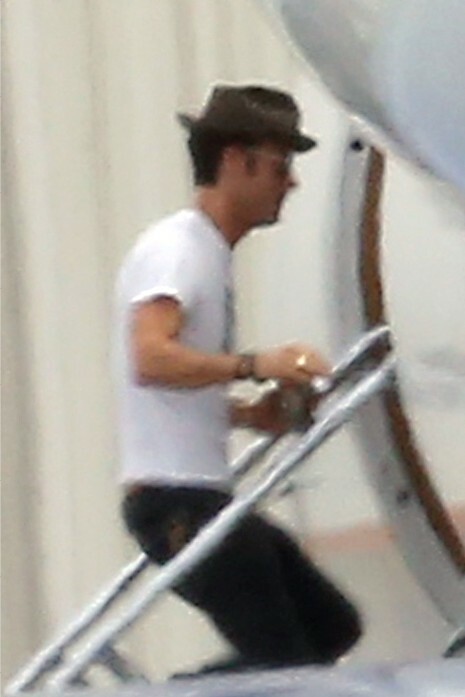 Christopher says he and Madonna are in touch by email, but she was not involved in his marriage to British hairdresser Ray Thacker in Beverly Hills Saturday. As far as we know, she didn’t send a gift either. That surprise engagement has quickly evolved into a wedding! 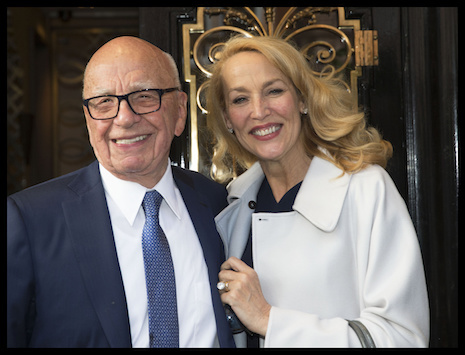 Former model Jerry Hall, 59, and billionaire Rupert Murdoch, 84, already had a civil ceremony and on Saturday they’ll have a big church wedding. This is his fourth marriage and Jerry’s first. (Remember – she never legally wed Mick Jagger.) She brings four kids, aged 18 to 31, to the union and Rupert has six children aged 12 to 57. This coupling would make a great reality show. Shahs of Sunset star Reza Farahan looks mighty happy walking with his newlywed husband Adam Neely and their “sweet little Marty “ in Los Angeles. 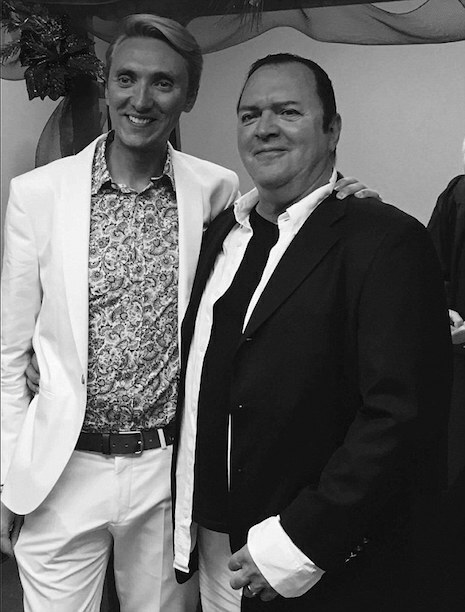 After a long up and down relationship, Reza and Marty had what was described as a “quiet wedding” in Palm Springs the weekend of October 3. Of course, it couldn’t have been THAT quiet, because it was filmed for the upcoming season.